Japan's popular series about life inside video games is getting another game. It lets you fly. Sword Art Online is a story with multiple arcs, perhaps the most famous being its initial story involving a game of death where players are trapped inside an MMO and dying in the game means dying in real life. The story had a spin-off video game on the PSP and a subsequent beefed-up port on the PS Vita. Now, the developers at Bandai Namco are releasing a sequel based on the second arc of Sword Art Online. 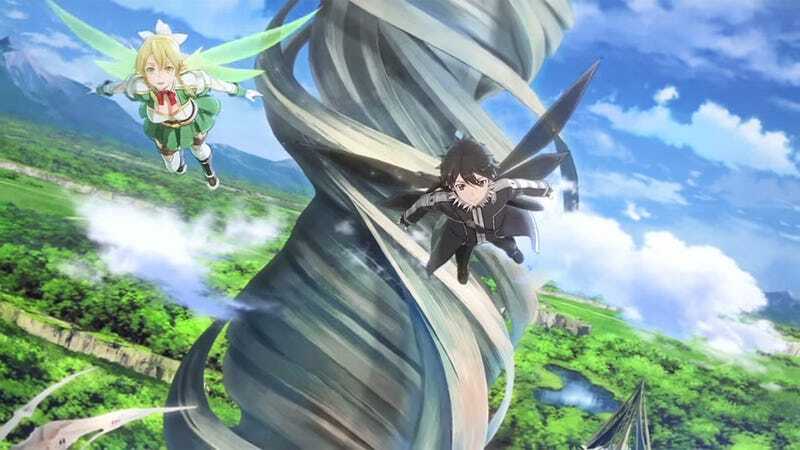 Titled, Sword Art Online: Lost Song, the game takes place in the world from the second arc of the story, ALfheim Online – a world of fairies and flight – and offers a new original story to the Sword Art Online saga. Free flight in a video game is a difficult trick to pull off but it looks like it's going to be the main thrust of Lost Song. The game is labeled as an "action game" as opposed to the previous game that fell under the RPG banner, so hopefully it'll be a little more fast-paced. Sword Art Online: Lost Song is scheduled for release on the PS3 and PS Vita in Japan in 2015. No word on an international release.